We realize that you may have questions about how the pigs that become the pork you eat are raised. We are going to answer some of those questions here. If you have other questions, drop us an email and we'll answer them for you. Take a 360-degree look inside a pig farrowing barn. Using antibiotics responsibly is important to pig farmers. They work with veterinarians to ensure the pigs are healthy and only use antibiotics when necessary to treat an animal that is sick. Learn more. Did you know that it's illegal to feed hormones to hogs? We know the labels make it confusing, but these producers give you the true story straight from their farms. 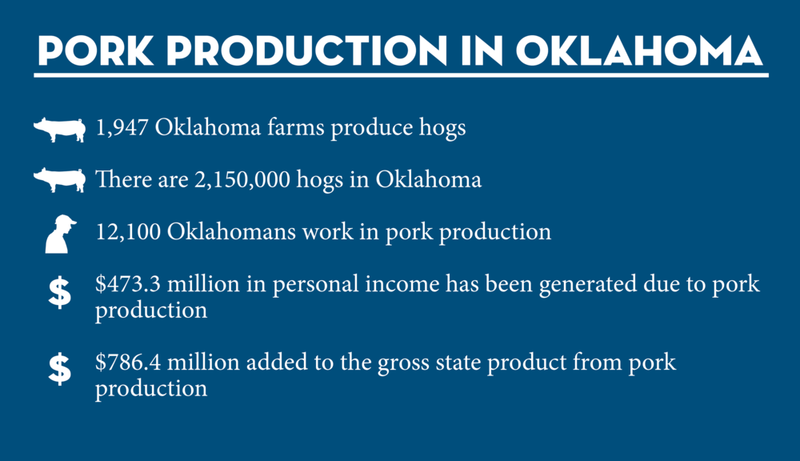 Pork production has a big economic impact on Oklahoma's economy. The stats above tell most of the story, but you can click here to learn more.